Black Canyon City, Arizona—A semi-truck hauling cattle on southbound Interstate 17 failed to avoid slower traffic, resulting in rear-end or side-swipe collisions with as many as 24 passenger vehicles. 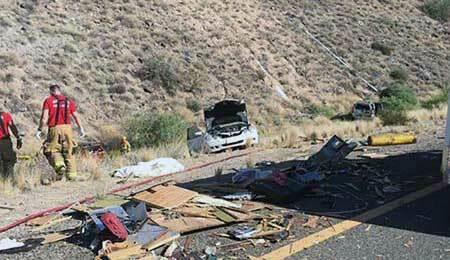 The accident occurred shortly after 1:00 p.m. on Sunday just north of Black Canyon City. Four injured people were air evacuated to hospitals, while 13 others were transported by ambulance to hospitals in Phoenix. The Phoenix Fire Department responded to the accident with multiple engines and ambulances and a ladder truck. The Arizona Department of Public Safety is still investigating the cause of the accident.